Coca-Cola, vinegar, and baby oil. It's an ingredient list that sounds like something bored kids might concoct on a rainy day. But these are just a few of the surprising products you can use to keep your toilet clean and in tip-top shape. What's more, repurposing common household items like these not only saves money, but helps cut down on harsh cleaning products that can be harmful to your family and the environment. These 10 weird, wacky-yet-effective toilet fixes that are worth a try. 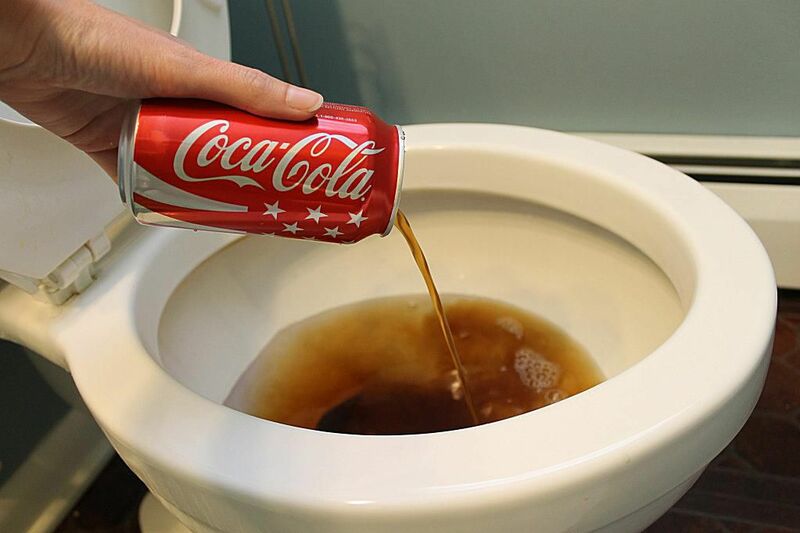 It may sound like an urban legend, but plenty of folks swear that Coke dissolves toilet rust rings. Here's how: Pour a full can around the rim so that it fully coats the bowl, then let it sit for at least an hour to allow the acids in the soda to break down the stains. Scrub with a toilet brush, then flush. If this isn't effective, it may be time for Tip #2. According to BrightNest, a pumice stone is another unexpected but effective way to get rid of that persistent ring inside the bowl. Always start by soaking the pumice in warm water — the stone and the toilet surface should always be wet to avoid scratches. Gently scrub the stain until it's gone, and then flush the toilet to rinse. Most people reach for bleach to obliterate toilet germs and stains. However, Green living expert Mark Lallanilla says that plain old white vinegar is not only an effective cleaner but also safer than chlorine bleach. To eliminate hard water stains, soak toilet paper in vinegar and place directly on top of the stain. Let the vinegar-soaked paper sit overnight. The next morning, flush to rinse and the stains should be gone. Lallanilla says that full-strength vinegar also works great on grout and caulk. Use a spray bottle to saturate the area and let it soak in for at least an hour before rinsing. Hydrogen peroxide is a safe and effective germ fighter. To disinfect your toilet, pour ½ cup of hydrogen peroxide into the bowl, let stand for 30 minutes, and then flush to rinse. You can buy fancy “fizzies” or “bombs” that clean and deodorize your toilet, but it's easy and inexpensive to make your own. Candle and soap expert David Fisher has a great, all-natural fizzy toilet bomb recipe that uses common household products combined with your favorite scented oil. I was amazed when I saw the shining results of baby oil applied to chrome fixtures. You can polish up your toilet handle — not to mention your faucets and showerhead — with just a few drops on a clean, soft cloth. Then, apply a few more drops to the toilet tank and toilet bowl and buff until the porcelain gleams. Keep your toilet seat hardware rust-free by coating the bolts and screws with clear nail polish. This will also prevent the seat from shifting around, since the screws will be less likely to loosen. To fix a clogged toilet without chemicals, fill a medium saucepan with water and bring it to a boil. Carefully pour the boiling water directly into the toilet bowl to dissolve the clog. According to BrightNest, a layer of bubble wrap can help prevent a sweating toilet tank. First, shut off the water valve to the toilet and then remove the tank lid. Flush and wait until the water drains out of the tank. Once the water empties, line the inside of the tank with a layer of bubble wrap – this added layer of insulation keeps the outside of the tank from getting too cold. 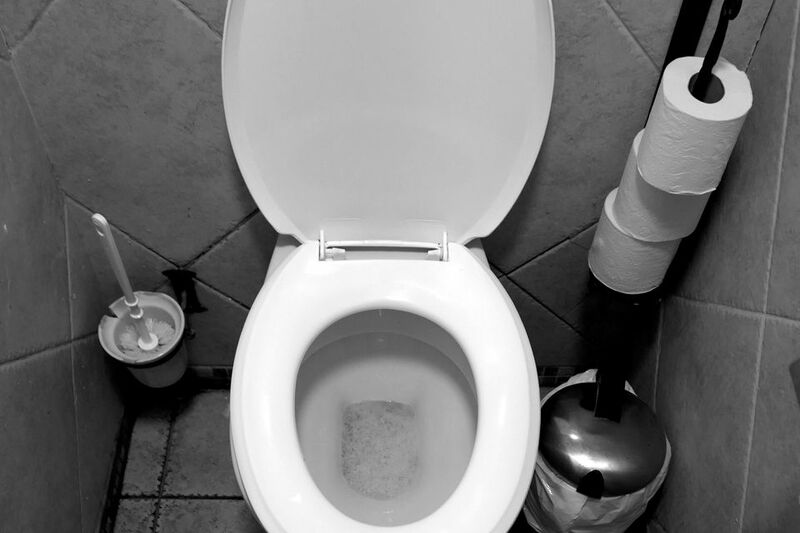 If your toilet isn't a newer model with water-saving features, there's an easy way to save money and cut back on wasted water. Fill an empty one-liter plastic bottle with an inch or two of sand and then add water to the top. Screw on the lid and place the bottle inside your toilet tank, safely away from the operating mechanisms. The bottle will help reduce water usage with every flush. Don't be weirded out by the strange ingredients. These cleaning tips really work! Give them a try and discover how you don't have to use harsh, expensive chemicals to keep your toilet clean. Aren't we better off drinking less Coca-Cola anyway?